Created by artist Martin Backes, this installation of a lone “robot” singing 90s power ballads is almost hypnotizing in a quietly terrifying way. Let’s hope the behavior of this device doesn’t reflect a desire, on the part of the machine, to become sophisticated enough begin giving motivational speeches to robots within earshot on how to overthrow the human race. It’s traveled from one side of Canada to the other. It’s also traveled extensively all over Europe. 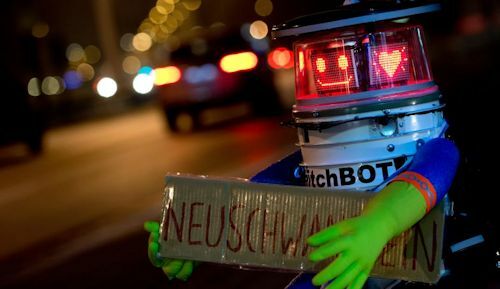 Because it’s an extremely low-tech, immobile, hitchhiking robot called HitchBot. And its just a little yard-sale-built robot reaching out to the world and hoping it’ll reach back. Maybe “robots” have something to teach us after all. Shoot us a photo and your story if you decide to help HitchBot get across the US at any point! A long time ago on the WeirdThings podcast, because we’re always ahead of the curve when it comes to hypotheticals about how new tech might be used in ridiculous scenarios, we pondered how someone might use smart-car tech to commit manslaughter by hacking a vehicle and driving it into a squishy human being. Jaguar is pushing that possibility into becoming a very real scenario. Currently the vehicle has severe limitations on speed (it tops out at 4mph) and the distance that the phone is from the vehicle (the car stops when the phone is too far or too close). It’s still early in development and still early to really understand how an average user might need this kind of control over their car with autonomous vehicles rolling into the public traffic and becoming part of our every day lives. It’s only a matter of time before curiosity…and an unmanned Range Rover with a driver on smartphone miles away…kills the cat that’s crossing the road. Our Childhood Dreams Are About to Come True: Two Huge Robots About to Throw Down! Since the very idea of giant robots the thought of giant robots beating the paneling off of one another has also existed. Recently the creators of the MK. II came out of nowhere with a video taunt aimed at Japan’s million dollar Kuratas. 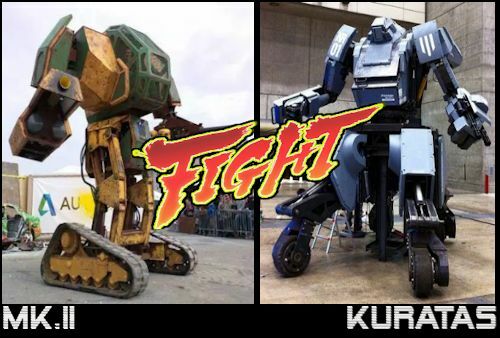 The creators of Kuratas responded with a snarkingly condescending video asking MK. II to put down its ridiculous cannon-ball launching and missile-firing weaponary and fight like a big metal man. The guantlet has been thrown. Now all we’re waiting for is a time and place. One crushingly loud, satisfying blow at a time. Posted in Fight, Gladiator, Robot, robot battle, Robots, Technology | Comments Off on Our Childhood Dreams Are About to Come True: Two Huge Robots About to Throw Down! Over a weekend at Fort Benning, human inventors of automated robotic war machines showed off the devices that Skynet will probably use against us when it goes live. Sorry ’bout your first rule, Asimov. Just when you think we’ve come to terms with robots and their place amongst us, they do something else that ruins all those happy-go-lucky feelings we had with them for just a brief moment. E-David, a robotic arm developed by the University of Konstanz in Germany, is teaching itself to paint. Using 24 colors and 5 different brushes, E-David takes a photo of its subject and then goes to work recreating it in paint. As E-David paints, it’s constantly checking back and forth between the photo it took and what it’s actually painting. If E-David decides that what’s hitting the canvas isn’t correct, it can change the process on the fly to work toward a better finished painting. Just another thing we can all give up doing when the robots take over. A small robotics company called Robugtix is about to give everyone something special whether they want it or not…arachnophobia. One of the company’s newest bots is named, simply and innocently, the T8. All of that simpleness and innocence evaporates quickly when you actually get to see the T8 in action. 3D-printed and housing 26 motors to move its creepy little self around, the T8 doesn’t just have the fact that it’s made to look like a spider going against it. When you see the T8’s movements is when you get to see just how amazingly and eerily realistic it looks. For about the price of one month’s rent in a metro apartment, you can grab your very own robotic nightmare from Robugtix which can either be controlled by you like your very own spidery, robotic minion or you can program the T8 to step through a sequence you create. Robugtix mentions how great the T8 is for someone to learn advanced robotics. About 10 or 15 years from now, super-villains will be sitting around talking about their formative years where they all owned a small, slightly menacing-looking robotic spider they had to send away for. Z Machine – New Robot Rock Band Makes Debut! Musicians are usually willing to jam with anyone that has some ability at playing an instrument. As we begin walking hand-in-hand with our quickly-becoming-commonplace robotic friends, it only seems natural that musicians and robots would start creating the modern equivalent of their own Wyld Stallyns. Other bands, like Compressorheads, have tread this road long before Z Machine. It just seems that right now we’re all a little more comfortable with our new metal friends and Z Machine has hit the stage at the right moment because of the reaction that the band’s had overseas. Z Machine performs a lot like an emo band who’s feet have been nailed to the floor in the video we’ve posted here. That looming alien thing in the background on the left seems to be on a union break. Despite the feeling that this performance is like we’re watching the result of something that’s been a weekend project between the glee and choir clubs, this is a simple, innocent example of how welcoming a new generation is of their new robotic buddies. Posted in China, Entertainment, Robot, Robots, Rock, Technology | Comments Off on Z Machine – New Robot Rock Band Makes Debut! Robot Learns to Throw…Humanity Flinches! Anyone who’s been following the evolution of Boston Dynamics has been creeped out at one point by their BigDog robot. BigDog is a quadraped robot that has learned a lot of tricks since it was a terrifying little puppy of a machine. It balances itself even when an engineer makes an attempt at cow-tipping it, it ambles over the most diverse terrain ever laid out in front of a robot, follows humans like an obedient pack-mule and even understands what humans are saying to it. Each stage in BigDog’s learning process has brought with it a level of creepiness. But BigDog’s newest trick just put the nail in the coffin of humankind’s demise. And what it’s throwing isn’t a spitball. It’s not a paper airplane. It’s not throwing Mardi Gras beads. It’s not a fun frisbee. And it’s throwing them easier and more accurately than you could ever hope to throw one. We should be worried about our own fellow humans helping them. Posted in Military, Robot, Terminator | Comments Off on Robot Learns to Throw…Humanity Flinches! Russian Team Creates Cheap, DIY Ostrich Mech – Future Armies Will Look Terrifyingly Ridiculous! Russia is a unique place. They drive a little differently there, meteors land there and now they’ve decided to tackle robotics…in the form a creepy walking robot disguised as a cute (but threateningly non-cute and blankly-staring) ostrich-walker. Like the love-child of an AT-ST from the Star Wars universe and the little robots from the classic sci-fi film Silent Running, this attempt at making roaming ‘bots cute just ends up making it all that much creepier. Why an ostrich? Only the group of four Russians calling themselves the Konstantin Ivanov could answer that question. Using parts you might find at home and your local Radio Shack, the team set out to contstruct a walking robot on an extremely limited budget as a way of showing what they might be capable of if someone actually opened their wallet for Team Ivanov. Expressions of horror from anyone who sees this thing marching toward them on the street? Posted in Animal Attack, Invention, Robot | Comments Off on Russian Team Creates Cheap, DIY Ostrich Mech – Future Armies Will Look Terrifyingly Ridiculous! Robot Begins Year-Long Mission: To Survive One Year of Elementary School Among Real Students! We’re always making references to the ‘Robot Apocalypse’ or about all of us being enslaved by ‘our future overlords’ when it comes to our slowly evolving erector set-like counterparts. While 30 and 40-somethings stand around and make jokes, robots continue their often awkward baby-steps into being a part of our lives. You know…the children forced to oil the joints of the those aforementioned ‘future overlords’ so that they can continue their ‘overlording’ of the humans? Those children won’t be worried because they’ll have grown up with robot friends at school. Higashihikari (sneeze it and it’ll sound just fine) Elementary School in Kyoto began a 14-month experiment just a few days ago where a new ‘student’ joined the fleshy ankle-biters’ ranks in order to collect data that will help ‘Robovie’ and other tin-men of the future to interact more naturally with various people. That way, instead of speaking atomic-age sci-fi robotic phrases like “You will not be needed” or “Exterminate!”, they’ll be sitting us down quietly and gently breaking the news our enslavement is really for our own good. Although this isn’t the first time that a robot has been placed in this kind of environment, this will be the longest amount of time that a robot has spent in the harsh, Lord of the Flies-like habitat of the elementary school student. Good luck surviving that, Robovie. Posted in AI, Experiment, Robot, Technology | Comments Off on Robot Begins Year-Long Mission: To Survive One Year of Elementary School Among Real Students!